First day of spring today- well technically this evening, so not yet. And so much for that. It's snowing and local schools in my area has early dismissal. WHAT?! Yeah..it's crazy. Just a few days ago, I wore my spring jacket and walked around and today it snows. I said it many times and I repeat, I AM SO OVER THIS WINTER! At least it's the last day today and I will not miss it. When it's gloomy like today or any rainy day, I tend to crave more chocolatey stuff with a nice cup of earl grey. Chocolate dessert is always nice but especially on a day like today. Looking at these pictures makes me crave some. 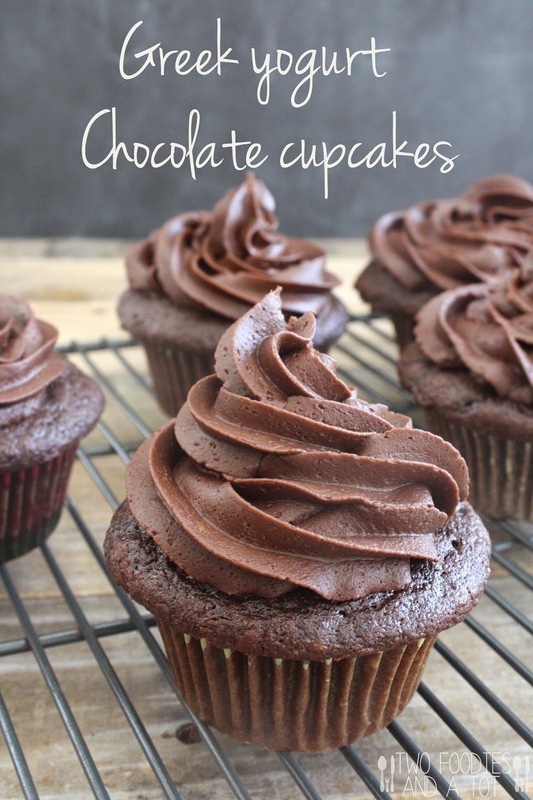 Cupcakes are cupcakes but this recipe uses Greek yogurt and it makes me feel healthier eating these cupcakes. A lot of times I substitute sour cream with Greek yogurt in many recipes. It's healthier but the main reason is, I always have yogurt at home but not sour cream. So, it's a win-win. 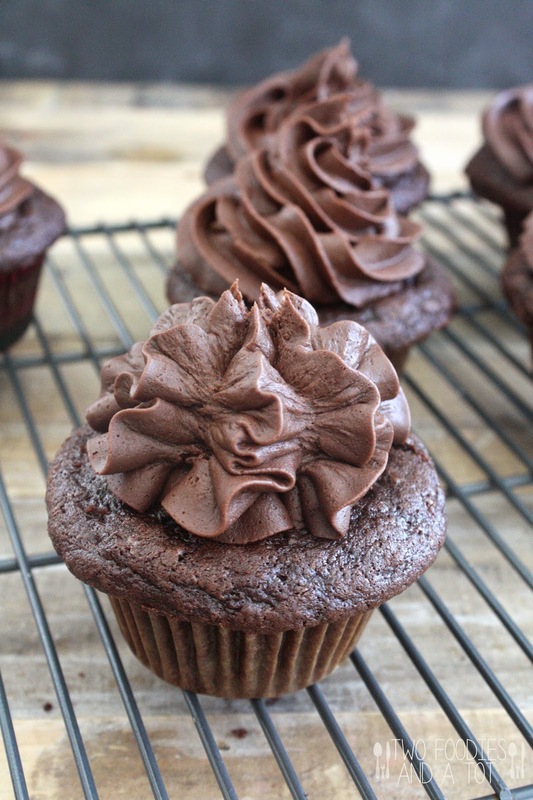 These cupcakes are super moist and decadent, you will not believe there's no butter or just a little oil. And the frosting is one of the best fudge frosting I've had. So rich and silky. I used the same pastry tip but tried different frosting technique on this one but I think I prefer the other way with this frosting. This type of frosting is very pretty with lighter color though. Like lemon cupcakes with spring flavored/colored frosting. Or cupcake in ice cream cones. I've done it in the past and those are adorable with this shape of frosting. 2. In another bowl, mix flour, baking soda, baking powder, unsweetened cocoa powder and salt. 3. In a large bowl, whisk together eggs, egg yolk, vanilla and both sugars until smooth. Add melted chocolate mixture and whisk until smooth. 4. Add half the flour mixture and half the yogurt. Repeat until all is just combined. Add coffee or hot water. Mix until just combined. 5. Divide the batter among 12 liner in the cupcake pan. Bake for 16-18 minutes or until toothpick inserted in the middle comes out clean. Let them cool completely. 6. Meanwhile make the frosting - sift together sugar and cocoa powder. Mix Greek yogurt and half and half. Cream the butter till smooth and add dry ingredients and wet ingredients alternating. Add salt and beat the mixture on high for 1 minute. 7. Frost cooled cupcakes and enjoy! *Recipe by Baker by nature.